On the road to Boruto and his group, searching for Mitsuki, there is Kokuyō. Kokuyō has enough strength to be able to defeat the Jonin that the Hidden Leaf Village sent to look for Mitsuki and bring Boruto and the others back. 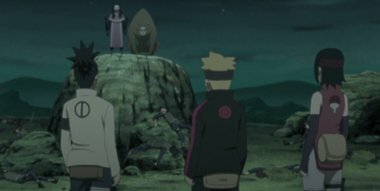 With the appearance of a helper, somehow they are able to repel Kokuyō and can finally have their desired meeting with Mitsuki, but...! ?